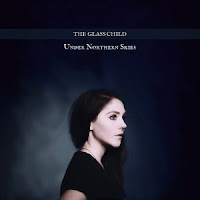 Under Northern Skies is the third album by The Glass Child, the nom de plume of Swedish songwriter Charlotte Eriksson. It's an intimately personal album of songs that she describes as "my guiding lights in the sky the last two years" and it takes just one listen of the album to be immersed in what feels like an immensely powerful one-to-one late night outpouring of the heart and soul. The album opens with The Year I Disappeared, the first track that was revealed. The intro is dominated by two piano notes repeating with a stark unsettling edge before haunting strings add to the effect until Charlotte comes in forty seconds into the album. It's a song of departure that talks of writing letters and throwing them into the ocean in a bottle as a means of escape. The song builds then drops back down to the piano, then builds again, the constant changes of pace simply emphasizing the uncertainty and the desperation of the emotions. Next up is Om Mane Padme Hum, which Tibetan Buddhists believe repeating mantra-like invokes all the teachings of Buddha and benevolent compassion. The song starts with a beautiful airy feel to it musically before Charlotte opens a tale of leaving home to find herself and peace with the line "a thousand nights I have travelled for truth, learned to quiet my mind, not to run from my youth." The song bursts into stunning life half way through, as much at home on a dance floor as in a confession box, the bold electronic tones making a stark contrast between words and music that simply serves to heighten the impact of the words. As it reaches its breakdown vocal harmonies take over, Charlotte's words almost inaudible underneath them as if words are lost in the fog and confusion of the subject matter. Dark Love continues the theme that its title alludes to, but again the music provides a counter to the lyrics. Bright, crystal crisp production is a contradiction to the wandering mind questioning why "everything is quiet, you say nothing to me now" with a voice whose range and scale imparts so much emotion that the listener feels involved. It moves into Interlude : I Was Never Here, which refers back to the year she disappeared of the first track "searching for the treasure my father left behind." It feels like a completely involuntary expulsion of feeling, openly and completely honest as the only means of moving on. It's uncomfortable but utterly compelling. Save Me starts with a solitary eerie piano that accompanies Charlotte's voice throughout; there's more clever use of backing vocals to accentuate the impact at just the right moments to break the sparse mood slightly. The song builds slowly, shedding its darkness and allowing Charlotte to show the full range of her voice, emphatic in the way she stresses certain syllables to impart exactly the right effect. For a song that's simple in its structure, it actually feels quite complex in parts to ensure that the listener gets the full impact of the tale it's telling. Lonely In This Love starts with an unsettling piano that ripples through the first verse until the song explodes in dramatic fashion, its production contrasting with so much of what's gone before and it's the most ambitious song on the album. The subject matter however hasn't changed as it reflects on "I'm tired of being alone" as she seeks out an unnamed lover. But No One Cares At All is sparse in comparison, but what it does beautifully is allow Charlotte's voice and words to breathe, to take centre stage. It's a song that imparts an honesty about coming to terms with loss and starting to fix things "if you take me to the start, I would never sell my heart, I would trade up my own way." Charlotte's voice turns it into something quite breathtaking, a song that it's impossible not to emotionally attached yourself to in a way that only music can make you do. What Would I Tell You Now is another song of reflection, a night time look up at the northern skies of the title as she muses over how she would handle things differently if she had her time over again. Once again the structure of the song adds significantly to the impact it has, allowing the words to take centre stage at the moments where they deliver their key message and the punchline that's centrelined with regret "you're not alone my friend, I will stay until the end." Same Skies is a fitting way to finish the album as it feels like a closure, a saying goodbye and a resolution to move on as the album finishes with the valedictory line "the years go by and I keep my truth, I look to the sky and remember you hoping some nights you do too." Once again the music helps to set the mood of the song perfectly, but it's the startling openness and honesty of Charlotte's word and the evocative manner in which she delivers them that makes this feel like you're somehow involved in the story. This album comes out into the world with the high ambition of "I wanted to turn my life into my art. My very existence into a poem. This is my story – it’s been a beautiful fight. It still is." The fact that it does exactly that, an exorcism of ghosts of the past, laying everything bare as a means of letting go and encouraging others to do so too. The four "stripped" versions of songs only serve to emphasize this fact. It's a record that comes from the heart and from the pit of a soul that's been broken and looking to heal itself through the medium of these song. It's one of those rare albums where you feel like you're living and breathing it with the artist - uncomfortable in parts but ultimately exceptionally rewarding. The Glass Child's official website can be found here. She is also on Facebook and Twitter. The album can be ordered, along with the previous two from The Glass Child's shop.